Reality SDC from Street Fair on Vimeo. We specialise in Self Defence & Conditioning Adelaide - Kickboxing, Krav Maga, Kettlebells and CST – "Meet life head on"
At Reality Self Defence & Conditioning our highest priority is for you, your team, or your business, to achieve your goals of better health, fitness and personal safety. 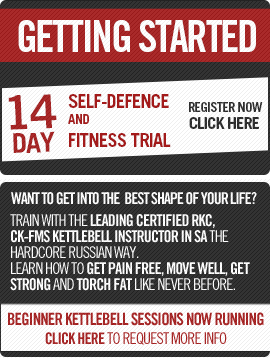 Our objective is to deliver intelligent and genuine functional movement and defensive tactics skills. At Reality SDC we train athletes. We train fighters. We train professionals. We train individuals. We train enthusiasts. Our list of previous and current clients includes members of the armed forces, security and prison personnel, law enforcement and tactical response teams, world aerobics champions, fighters, marathoners, triathletes through to general fitness and fight enthusiasts. Our clients have chosen to BE good, not just look good. They have dared to challenge the current norms, trends, fads, gimmicks, magic potions and quick fixes to gain superior results, performance, durability and self defence skills both physically and mentally. We pride ourselves on being on the cutting edge of physical culture and defensive tactics. We use old ideas, and new ones. We are highly qualified, educated and motivated with a genuine burning passion to see our members exceed their expectations and reach their unlimited potential. We deliver expert advice and personalised service in an outstanding culture that relishes challenge, intensity, fun and family. Get Your Free Training Tips From Coach Matt Here! Have Reality SDC email you directly with training tips on Fitness, Nutrition, Muay Thai, Kettlebells, Krav Maga, CST and Functional Movement via the Reality Check Report. Are you concerned for your personal safety or that of a loved one? Want to get a great sweat whilst learning skills that one day might save your life? Learn one of the most effective defensive tactic systems and some of the best self defence skills available in the market today. Learn Krav Maga in Adelaide (Contact combat), the system that is taught to the Israeli Defence Force (IDF), Military, Law Enforcement, VIP protection and security companies’ world wide or simply come in for a great sweat to build superior Muay Thai and boxing technique and conditioning. Looking to throw your gladiatorial hat in the ring for the first time or are you a seasoned veteran? Be a part of our Muay Thai fight team and surround yourself with some of the most experienced coaches and fitness professionals in the country. Personal training is a vehicle for health and lifestyle enhancement and the expedient achievement of fitness and health goals. Are you tired of your current fitness routine? Bored of doing hours of weights, cardio on a treadmill, bike or cross trainer? Do you experience the discomfort of joint pain and/or lack of flexibility? Have you been looking for a true, simple and fun way to be fit and healthy? The days of high tech gyms, low or no skill programming, seated selectorised leg machines; body disassociation and building the body in isolation for aesthetics and poor function are over! Learn the skills and how to use the tools that strongmen have used throughout the ages by using their bodyweight (calisthenics), Kettlebells and Clubbells to create superior strength and fitness from a certified and qualified coach. Learn to build what the Greeks used to call “Kalos Sthenos” or “beautiful strength”. Create pain free and ageless mobility, poise, grace, symmetry and flow from sound structure, breathing and correct functional movement patterns with us.